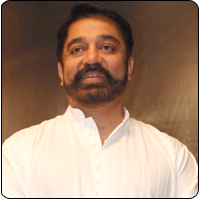 Kamal Haasan has said that working with director KS Ravikumar has always been a great experience. According to Kamal, the duo shared a good rapport and the entire shooting spot would be lively with fun and frolic when they worked together. However, this was not the case during the filming of Dasavatharam. Dasavatharam being a very difficult film, with Kamal donning 10 different avatars, there was no room for jokes and fun. Apparently, the entire unit was working hard in a strained atmosphere to get each shot right. But this will change with their next film together, which is being produced by Udhayanidhi Stalin. Kamal and KSR expect to bring back their good old days back on the sets.